The website is optimized for both mobile user experience & desktop browsing. Use a smart phone or other mobile device on the crawl for web app views. The top menu guides to basic sections of the website. For mobile use the hamburger icon on the left labeled MENU. This website is clickable & touchable—just click/touch items of interest. How do I find Artists & Art? Artists are organized by Site numbers & addresses, media Categories, and sometimes at Sponsor sites. Scroll through artist listings, select a Category, or Search for artist names or descriptions of artwork. Use the search box to enter an artist’s name or type of artwork you are looking for. 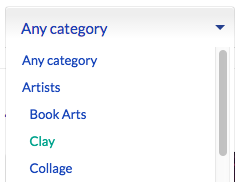 Use the filter at the top of a set of artists for a list of categories. Select from the dropdown list. Artists in Any category is the top default, or scroll through the list of categories to select a specific genre of artworks. 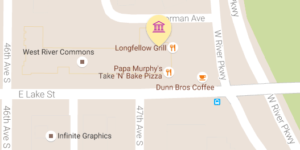 Use the interactive map to zoom in & move around a geographical location in the Greater Longfellow neighborhood of Minneapolis. You’ll see streets, landmarks, & businesses. Balloon numbers indicate how many Sites are located in a small region. Click on a balloon with a number to zoom in & see the various Sites with Artists, each represented by a Category icon. Click on a single Category icon to reveal a popup card for that artist showing their name, artwork, site #, & street address. How do I switch between Artist Listings & the Map? The web directory displays Artist Listings & LoLa Crawl Map side by side for desktop browsing. Is it safe to use the Interactive Mapping on my mobile device? We do not ask for nor track your geographical location. 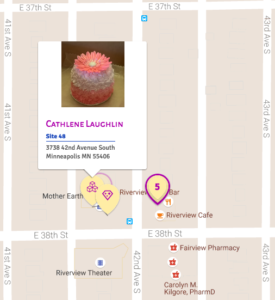 You may use the Location search box on the map to manually move to a specific area. How do I navigate on my mobile device to a Site? ↳ Get Directions on an Artist page links to Google Maps on mobile devices. How do Site #s on the printed Directory work on the Web version ? Artist listings are sorted in order of their Site #. Artist & Site listings all show the Site # with the Address. Numbers on the web map count artists & sites clustered on balloons. How does an artist get into the LoLa Art Crawl? There is an annual call for artists in the Greater Longfellow neighborhood to enter the LoLa Art Crawl. Please sign up for email notices on our Contact Us page.